Many companies we work with will decide to do additional signs on their vehicle if they have company vehicles. It is a great opportunity to introduce your business to new customers and the wrap or graphics will pay for themselves from the exposure and new business you get. Using vehicle wraps and graphics you can advertise to consumers even while sitting in traffic! Mobile advertising is not as aggressive as radio and TV ads. People are more likely to respond positively when they do not feel like they are forced to pay attention to your advertisement. Mobile advertising is far cheaper than paying for a billboard and will be seen by far more people. While you may see many car wraps on the street, an economical alternative to a full or partial wrap is to add graphics and text to the doors, sides, or rear of your vehicle. You can still advertise your business at a fraction of the cost. We can contour cut your logo to be placed onto multiple parts of your car, and cut out lettering that provides more information regarding what your business does and how people can get in contact with you. We can make graphics as small as your side window or as large as the side or back of your box truck. 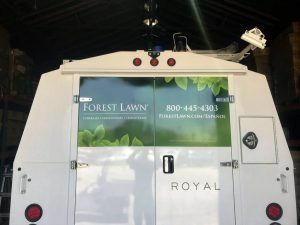 We’ve done quite a few vehicle graphics for Forest Lawn to advertise their business, their flower shop, etc. They wanted to advertise their business to other language demographics so they asked us to make some graphics in Spanish for one of their vans. 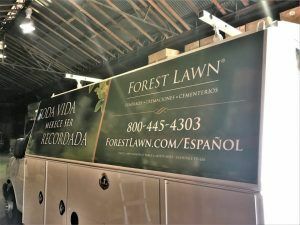 The graphic not only advertises that the company has Spanish-speaking employees, it also has the link to Forest Lawn’s Spanish website so that those who are interested can easily access information about the company and learn more about the services. There is also a phone number just in case the person would prefer to speak to someone over the phone and ask questions. Most of the signs we do for Forest Lawn incorporates their company colors or at least has their logo. The image that they used for the background worked great with the company colors. The two side graphics have the same information, it’s just mirrored so the logo is toward the back of the vehicle on both sides. Vehicle graphics are affordable and effective. If your company has a vehicle, any form of vehicle advertising is a must.